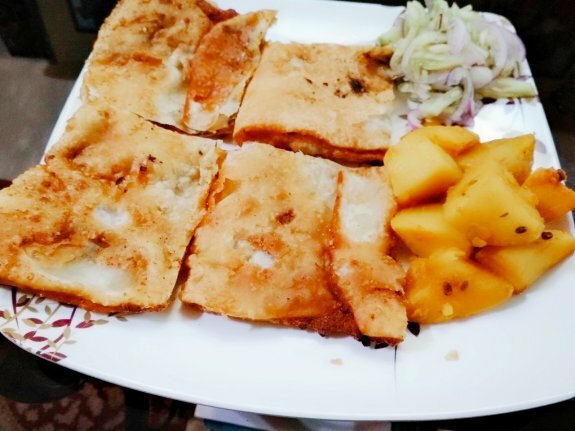 Mughlai Paratha is a popular dish from West Bengal street food which is fried bread and enhanced by the stuffing of egg. You can also use keema, onions, coriander leaves and pepper or other stuffing with similar ingredients to give it a delicious taste. You can have this with Salad or Aloo Sabji. Find this tried and tested recipe at The Masala Route. 1. Combine flour, oil and salt together in a bowl. Mix it very well till it resembles like fine bread crumbs. Then add warm water little by little and knead it. You have to make semi soft, pliable yet stretchy dough so that you can able to roll it. 2. One you knead it well, smear little oil on the dough and cover it with damp cloth and keep it aside for 30 minutes. 3. Now, need to prepare the egg stuffing. Take a bowl and add chopped onions, garlic, coriander leaves, green chillies, eggs, pepper and salt. Beat it well. The stuffing is ready. 4. After 30 minutes, take a ball out of dough and roll it to give it round shape like roti with the help of some flour. 5. Keep rolling out as thin as possible (but not paper thin), otherwise it would not hold the stuffing properly. 6. Put the egg stuffing it the middle and spread it little. 7. Now, fold to opposite side towards center. Similarly fold another two ends so that it could completely close the filling inside. Make sure no filling will come out. 8. Gently slide the paratha. 9. Now, cook on low flame else inner egg filling will remain under cooked. Splash the oil gently on the sides of the Mughlai Paratha. This way it can get enough oil to cook. 10. Cook until both sides will turn into golden brown. 11. Now, take out on a paper towel and serve it with salad or tomato ketch up or aloo sabji etc.